Ongoing – September 29, 2013, Richard Diebenkorn: The Berkeley Years 1953-1966, De Young Museum, Golden Gate Park: This exhibition examines one of the most complex periods in the distinguished career of Richard Diebenkorn, exploring his shifting conceptions of abstraction and figuration through 131 paintings and works on paper, and emphasizing the formal evolution of these diverse works, their interrelationships, and their possible meanings for the artist. His artistic evolution during what is now known as the “Berkeley period” yielded many of his best-known works and marked this era as one of the most interesting chapters in postwar American art. The Berkeley period included an abstract phase (1953–1956) and a figurative phase (ca. 1955–1967) that included landscapes, figures, interiors, and still lifes. 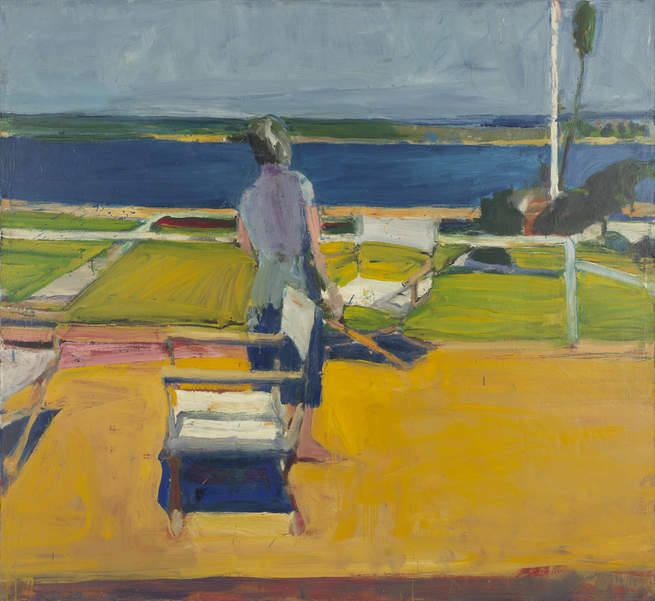 This is the first exhibition to focus on this pivotal period in Diebenkorn’s career, don’t miss it. June 28 – November 30, 2015, Kota Ezawa, Boardwalk, Yerba Buena Center for the Arts: San Francisco based Kota Ezawa rebuilds a side view of the Seaside Heights boardwalk, devastated during Hurricane Sandy, in YBCA’s Third Street Courtyard. Boardwalks themselves hold a special place in the American experience. In the aftermath of the storm’s destruction, the image of the recreated amusement park evokes a sense of melancholy for a form of entertainment destroyed by rising seawaters and unpredictable weather patterns. Titled Boardwalk, this bold architectural structure is transformed—the amusement park becomes a sculpture, and a courtyard becomes an amusement park— revealing the shared visual and experiential elements between these two environments. Restoring the boardwalk by proxy, the project, in the artist’s words, acts as a type of “visual disaster relief.” On view at 3rd and Mission Streets. Opening night party, Friday, June 28, 8pm. Kota Ezawa: Visual Disaster Relief from YBCA on Vimeo. 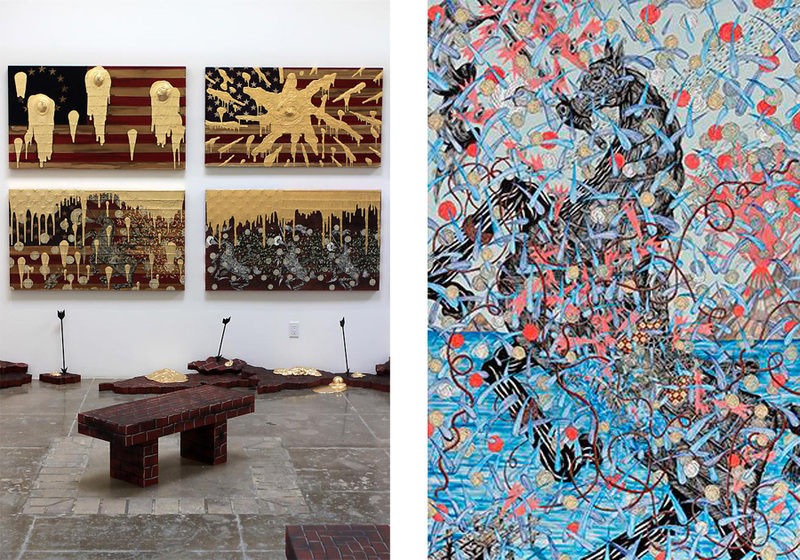 July 5 – November 17, 2013, In Process: Andrew Schoultz at the Monterey Museum of Art, La Mirada location: Andrew Schoultz is a San Francisco-based artist who creates monumental public wall murals, paintings, sculptures, and mixed-media installations. He generates a high-energy impact with an overpopulation of meticulous renderings and controversial themes that resonate with cataclysmic force. Schoultz’s imagery is furious and fantastical yet deeply rooted with American historical symbols and contemporary metaphors that create a vortex of political and environmental commentary. His influences merge 15th century German map making and 14th-15th century Persian miniature paintings, juxtaposed with highly-stylized graffiti and street art. 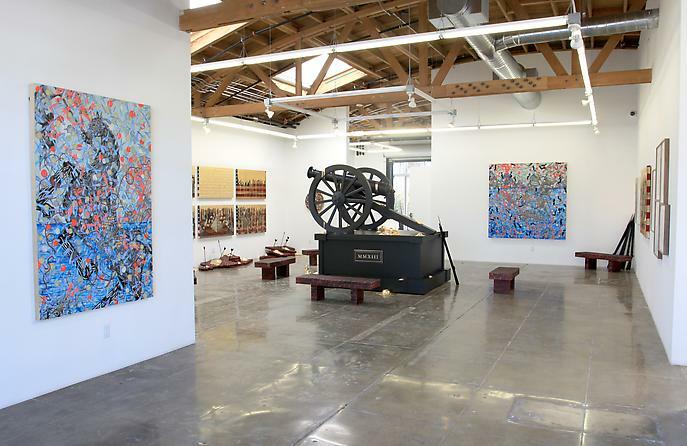 Andrew Schoultz will create a site-specific installation and mural on the walls of the Jane and Justin Dart Gallery at the Museum’s La Mirada location, based upon the local histories of Monterey, and present his wildly gilded Fallout installation as previously exhibited at Mark Moore Gallery. Starting July 5th you can visit to watch Schoultz in action finishing his mural, the opening reception is July 12th from 6-8pm. Monterey Museum of Art-La Mirada, 720 Via Mirada. 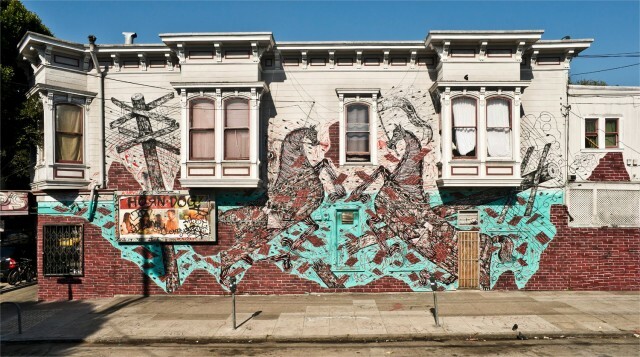 If you can’t make the exhibit at the Monterey Museum of Art, stop by Pop’s Bar at 24th and York Streets in San Francisco to see Andrew’s new mural. July 11 – August 31, 2013, Journey Forth: Contemporary Landscape Between Technology and Tradition at Gallery Wendi Norris, 161 Jesse Street: A group exhibition featuring paintings, sculptures, digital images, and videos. These artists construct a new vision of the world we inhabit, deconstructing traditional concepts of the sublime, and what it means to bring the outdoors inside. Artists include Brice Bischoff, Val Britton, Castaneda/Reiman, Kevin Cooley, Gregory Euclide, Patrick Jacobs, Tania Kitchell, Mary Anne Kluth, Matthew Moore, and Clement Valla. Opening reception July 11th, 6 – 8pm. top: Mary Anne Kluth “Above the timber the mountain is naked, and all above nine thousand or ten thousand feet is a scene of unmixed and unrelieved desolation—rock, snow, and dry soil, that is all”, 2013, archival inkjet print. 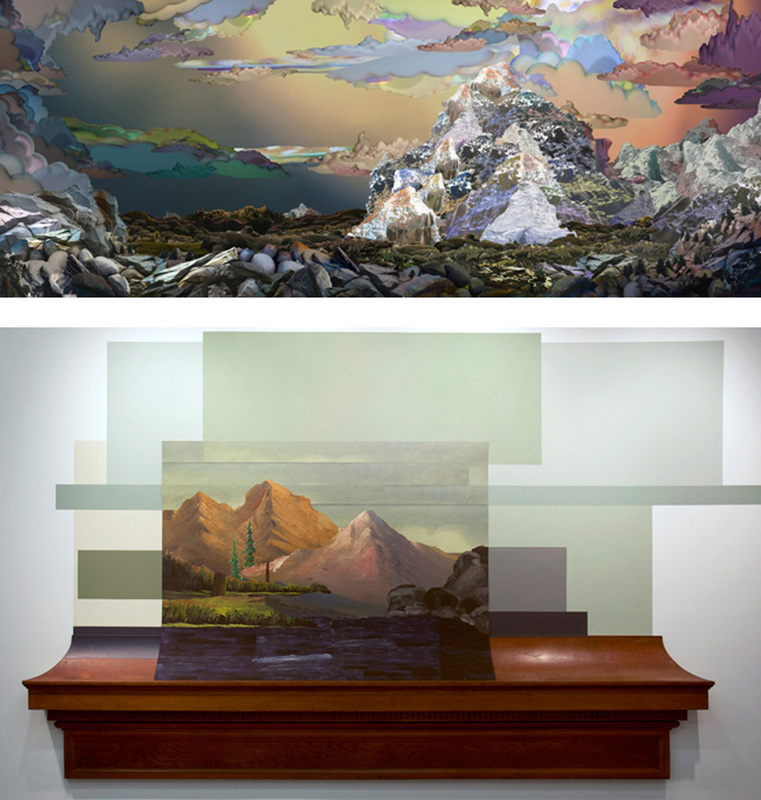 bottom: castaneda/reiman, “Landscape with Mantle (collage)”, 2011 mixed media.